If you were inspired by last week’s decor post “18 Rooms with Woven Wall Hangings,” you might find a woven wall hanging here. These 18 woven wall hangings are all for sale (from mainstream brands and StyleCarrot partners, as well as indie shops and makers). Anthropologie commissioned Robert Dougherty and Janelle Pietrzak of Los Angeles studio All Roads Design to create a few one-of-a-kind handwoven tapestries. 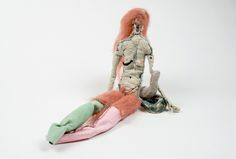 Urban Outfitters has a an array of about 20 wall hangings, in macrame, hemp, and wool, with metal and wood accents. Interior designer Nate Berkus even created a woven wall hanging for his Nate Berkus x Target collection. My favorite woven wall hanging here is #1 by All Roads Design, which would look fantastic in the Florida condo. But it’s pricey, so I ordered #10 by Rainie Williams in Newcastle Australia. It should look perfect with the coral and pink pillows and artwork. (You can see a photo of the Florida living room in the cork floors post). There’s something quite cool about #11 too; I think I may try something similar in the model apartment I am decorating. Would you hang one of these in your home? Or are you afraid it would seem misplaced in time? Or too trendy? Or ugly? I think some are quite elegant. When you click through to some of these handmade woven wall hangings on Etsy, you’ll be able to see other designs too. Let me know if you buy one and send a photo of your tapestry in situ. In November I blogged about the revival of the house plant in contemporary decor. Today, it’s about another 1970s decorating phenomenon, woven wall hangings. Woven wall hangings, be they monochromatic macrame wall hangings that look like they came from camp or more involved multicolored multi-textured fiber art extravaganzas, or even just a flat weave rug on the wall with some string pulled out (seriously, I’ve seen that), are everywhere. Yes, you can find funky woven wall hangings at Urban Outfitters and several beautiful hand-woven tapestries at Anthropologie, and of course Etsy has a plethora of woven wall hangings. All this weaving is actually referred to as fiber arts by serious artists, and I believe the art is thriving. When I was visiting a friend in NYC this fall, I noticed a little place on an Upper East Side side street that offered weaving classes. I have a design-oriented friend who was so inspired by the recent spate of wall hangings in decor that she bought her own loom! I can’t wait to see the results. My mother-in-law has a huge, wonderful loom in her attic (she was a weaver before she became painter); perhaps I can get her to stage a revival and whip me something up. The fiber wall hangings look really beautiful in isolation. I have been tempted to purchase one. But then I wonder if I could really pull off the look. Will it look too wooly? Too hippie? Too trendy? Here are 18 rooms with woven wall hangings that get it right. If you’re interested, I’ll follow up next week with a buying guide. 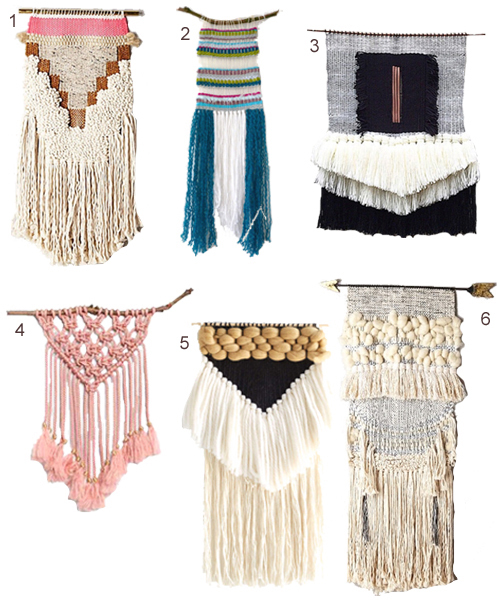 Here’s that buying guide: Get the Look: 18 Woven Wall Hangings.